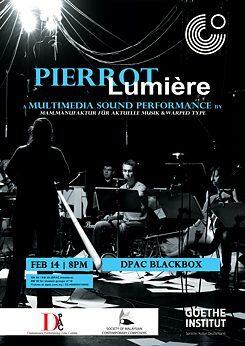 The MAM.manufaktur für aktuelle musik is coming to Kuala Lumpur this February for a multimedia sound performance in collaboration with Warped Type (Visuals), entitled "Pierrot Lumière" at DPAC. Invited by the Goethe-Institut, their premiere Southeast Asia tour will take them to Indonesia, Malaysia, Philippines, Vietnam and Myanmar. 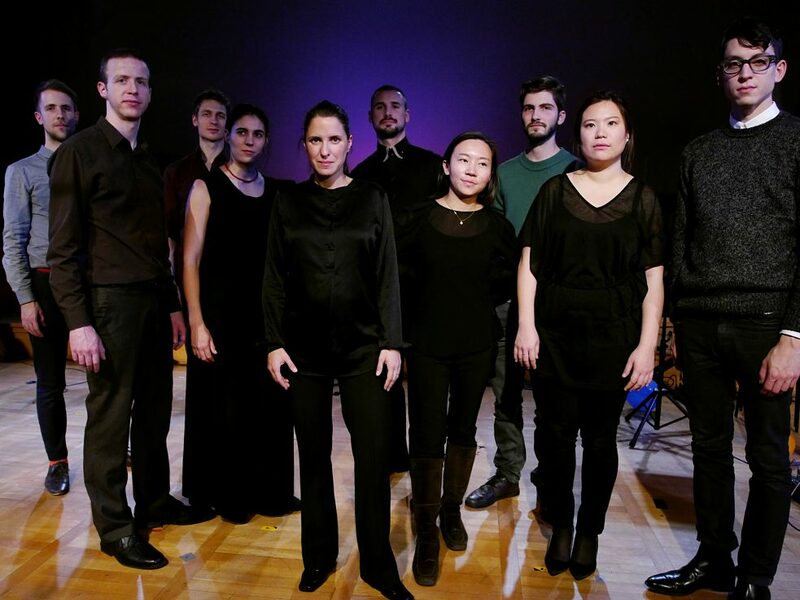 MAM.manufaktur für aktuelle musik was founded by International Ensemble Modern Academy scholarship holders in 2010, in response to a common passion for new forms of expression and performance in the music of today. The musicians see themselves as a liberal and internationally positioned collective, one that extends the idea of an ensemble through interdisciplinary engagement, bringing to life new sounds and sound concepts. MAM works with composers such as Mark Andre, Georges Aperghis, Hans-Joachim Hespos, Robin Hoffmann, Neele Hülcker, Jagoda Szmytka and Simon Steen-Andersen, and maintains a performance schedule at festivals such as Eclat in Stuttgart, the Darmstadt International Summer Course for New Music, AchtBrücken Festival and New Talents Biennale in Cologne, Mixtur Festival in Barcelona, Klangwerkstatt Berlin, pgnm Festival Bremen, klub katarakt festival Hamburg, Schönes Wochenende at Tonhalle Düsseldorf and ZKM Karlsruhe. 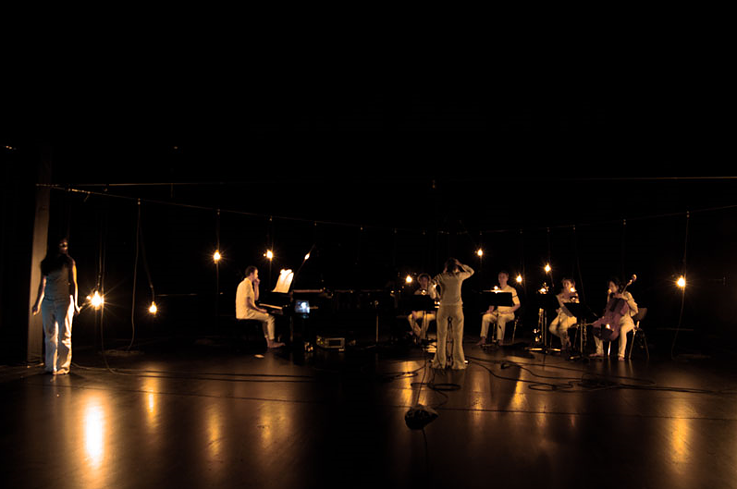 In 2012 the MAM musicians recorded Mauricio Kagel’s Exotica for DVD (Ensemble Modern Media) and in 2015, a CD of new works by Ying Wang for Wergo. In addition to the cultivation of contemporary repertoire, the musicians are committed to the upkeep and extension of alternative and/or experimental playing techniques at the nexus of performance, improvisation and the interpretation of composed music. MAM is a place of experimentation, boundary crossing and improbable confluences. WARPED TYPE’s work includes music videos, live visuals, stage design as well as interactive art and installations. Their members are Andreas Huck, Roland Nebe, Florian Breuer, Stefan Hings. More than a hundred years later, the question who this Pierrot Lunaire, central figure of the work, actually was still lingers: A romantic, a lunatic? A man, a woman? A real person or just a projection? The German ensemble’s contemporary version of the Pierrot focuses on the ambivalence of the figure – in their rich stage performance the musicians follow the Pierrot through a network of different virtual spaces created by the video installation: uninhabited nature and urbanity, transit zones, open spaces and narrow alleys let the sceneries of the original story come to life. MAM.manufaktur für aktuelle musik is supported by the Goethe-Institut Malaysia, Damansara Performing Arts Center and the Society of Malaysian Contemporary Composers.